When going to Florence, you’re in for a real treat. This ancient city in Tuscany is packed to the brim with famous sights and for a good reason. The history of the city is exuberant, the architecture astonishing and the art is notorious. Florence can be overwhelming too. 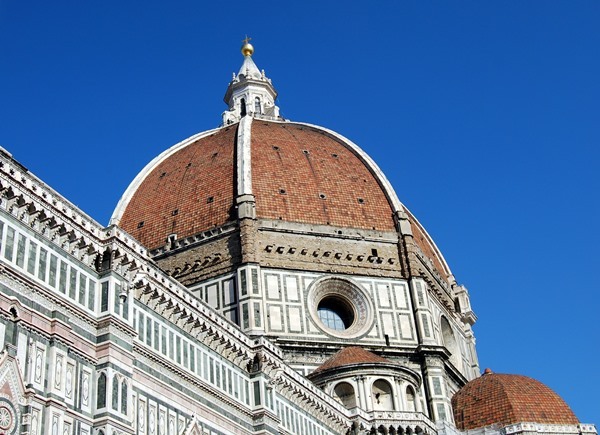 Its main attraction is the Duomo of Florence and the sights around it. There are 5 ways to explore the Duomo of Florence. I’m here to help you break down the 5 ways to explore the sights around the Duomo of Florence. You can’t miss it. It’s there. It’s on every image, postcard and travel brochure. The cathedral of Santa Maria del Fiori. Il Duomo is the famous landmark of Florence. It’s big, it’s old and it’s right in the center of Florence and you can’t miss it. The Duomo of Florence is the main attraction of the city. Officially named the Cathedral of Santa Maria del Fiore, it translates as the Cathedral of the Holy Mary with the flowers. Nicknamed Il Duomo in Italian or Duomo in English/Italian. The cathedral is a fascinating piece of architecture. The building is overwhelming. Literally. You can’t really see it completely from the ground, so you have to put your head wayyyyyyyy back in your neck and look up. It feels like the facade of the Duomo is trying to tell you a story but you’re so distracted by all the white and pink and green that is going on, you lose track of the story. Read more: Amazing Cinque Terre in Italy. When you step a little further back, you’ll be able to see the full scale of the Duomo with Giotto’s Bell Tower standing tall besides it and when you’re far enough back, you’ll be able to see the Brunelleschi’s big dome. The red/orange like brick is such a famous feature of the building, you’ll recognize it from far away. Actually, I liked the Duomo of Florence the best, when I was not too close to it. The steps of the Duomo are flocked by tourists of all kinds. All equipped with a selfie stick or a colourful hat. It’s overcrowded when you’re up close. I enjoyed the Duomo the most from our apartment’s window. Or from the hill overlooking Florence. Or walking towards the Piazza del Duomo and see a hint of the building in the distance. 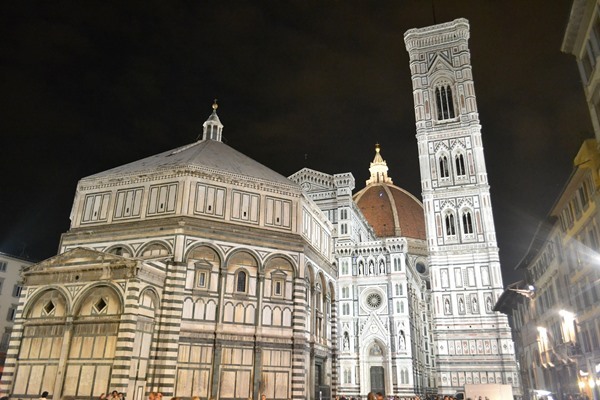 How to visit the Duomo of Florence? Ok, so are you’re already excited about going to Florence and want to explore the exterior of the Duomo of Florence? It’s 100% free and you can do it at any moment of the day. But, if you want to follow me and explore the rest of the Duomo of Florence, we need to buy a ticket. You have to visit all the monuments within 24 hours of visiting the first one. That doesn’t sound too bad now does it? Well, the opening hours of each of these famous sights in Florence are not always continuous or complimentary. They vary depending on the season, the day of the week and for special occasions. To add to this: these monuments are the most famous sights in Florence so they are popular. Very popular. This means you have to wait in line and might not be able to do everything you want to do in 1 day. After I examined the outside of the Duomo many times, it was time to head in. I couldn’t wait to see what the interior of the cathedral looked like. Well, what can I say about the interior of the Duomo of Florence? Who comes home and raves on and on about the marvelous splendor of the cathedral’s interior? Not many. Together with the Duomo of Milan, this might be the most contrasting interior of a cathedral I’ve seen. It’s richly decorated exterior and exuberant sculptures and different colours of marble, makes you believe the inside will be a true masterpiece of Gothic cathedral building. Well.. maybe it was. The focus point being the dome, which is hard to see from the ground up. I can imagine going to this cathedral was a religious experience. Not distracted by art, sculptures, paintings or gold and marble. Not showing the richness of the church, but only leaving room for contemplation. A lot of room for contemplation. I’m not going to say you shouldn’t visit the interior of the Duomo. Only when you see for yourself you can make an assessment. Only after seeing the interior, you’ll have new appreciation of its exterior. But, are you short on time? Not a big church or architecture lover to begin with? Go see one of the other famous sights of the Duomo of Florence and don’t waste your time, standing in line to get inside the cathedral. 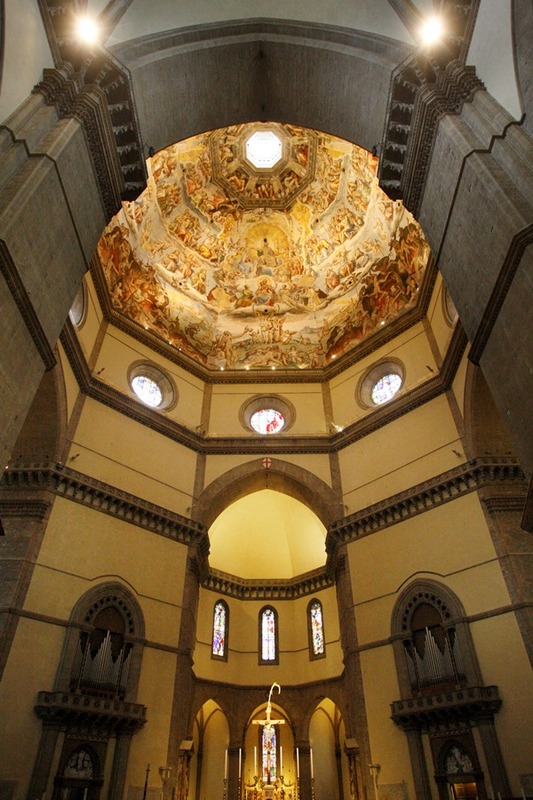 Have you gone inside the Duomo of Florence? What did you think? I L*O*V*E*D the Bell Tower. Standing on top of it was amazing. Looking at it from the main square was like seeing a masterpiece of art unfolding in front of your eyes. All the patterns and shapes on the sides of the Bell Tower seem to fit and look like they are placed right where they belong. Although the marble used, was not from Florence, it feels like the Campanile is at home. The Bell Tower towers over the square and with its lean figure, it looks very elegant next to the bulky and busy building of the Duomo. You can imagine the Bell Tower was the inspiration for Rapunzel’s story. At first sight, you do not see a door, just the slender tower with the balcony. It makes you want to climb it and look out over the city of Florence. Luckily for you, you can! 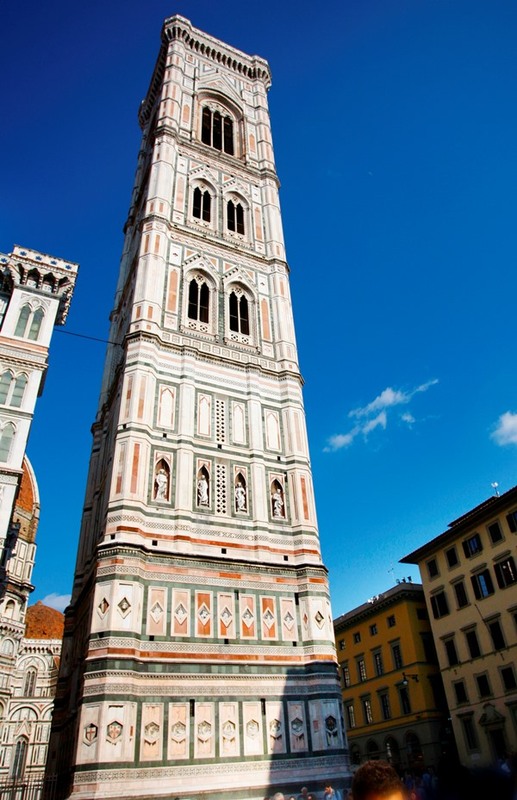 Climbing Giotto’s Bell Tower is one of the must do things in Florence and it’s included in the ticket. After half an hour in line, we were able to climb the Bell Tower. Jippie! Up, up we go. You need to cover the 84,7 meters by climbing 414 steps. That’s a lot! Luckily, there are 3 platforms were you can rest a little and collect your breath to climb the remainder of the tower. As the same steps are used for both the upwards and the downwards direction, traffic jams are not uncommon. Although I love the Bell Tower, I really hated the climb. You are standing on these small steps, pushing yourself against the wall. In the meantime a whole stream of people is forcing themselves along you and you’re trying to keep your footing. The steps get smaller towards to top. The ceiling gets lower and it feels like more people are descending. I’m not claustrophobic by nature but I just wanted to get out! Once you pass all this, you’ll be rewarded with one of the most fabulous views of Florence. You’ll be able to see all the red roofs of the city. The green hills in the distance. But also, and this is a real bonus: the Duomo of Florence beneath you and a magnificent view of the actual dome of the cathedral. Blue sky, sweeping vistas. Truly one of the most spectacular sights of Florence you cannot miss. While we were in Florence, the Baptistery was covered in scaffolding. Sadly, we couldn’t see its true exterior. 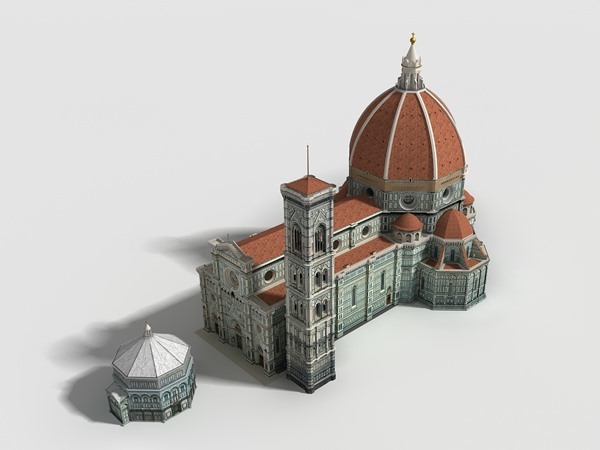 But it’s supposed to be built in the same style as the Duomo of Florence, making them a whole. 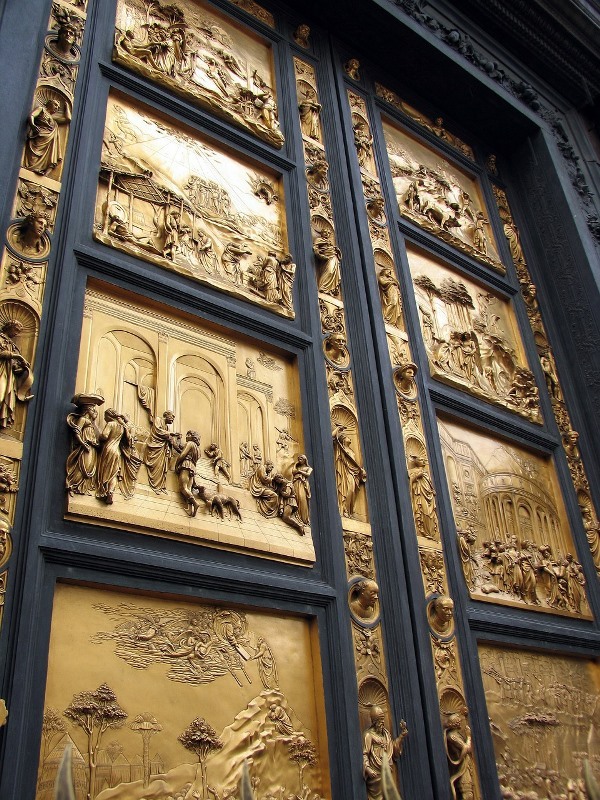 The famous bronze doors by Ghiberti were visible but it was difficult to get a good look at it, because of all the flocking crowds that come to see the famous sights of Florence. 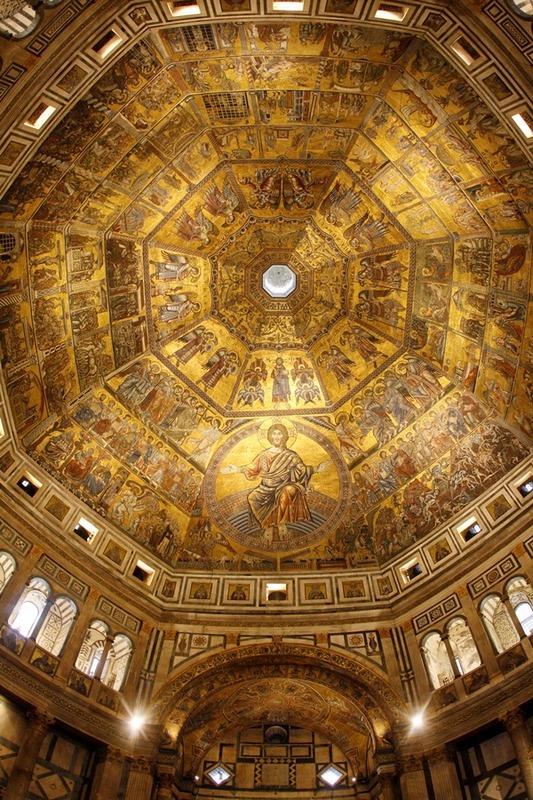 However, on the inside, you’ll be greeted by the celestine calm character of the baptistery. This octagonal building was constructed between 1059 and 1128 AD and the main feature is the mosaic ceiling. This detailed mosaic is depicting the Last Judgment and other stories from the Bible. As I’m not religious, I do not know the tales of the book. But I recommend taking a leaflet at the entrance, where they explain to you what you see and why it’s important. I spent a good portion of the morning inside. I took a seat after looking around and just put my head back and looked up. The contrast between the colours and the gold is magnificent. It really feels like the figures are speaking to you. Telling their story from a long time ago. The travel blog avant la lettre as I’d like to think. Another thing you can do with your ticket is climbing the Dome of the cathedral. We didn’t do this as we just climbed the Bell Tower the day before and we didn’t have much time left. Brunelleschi’s astonishingly innovative approach involved vaulting the dome space without any scaffolding by using a double shell with a space in between. The inner shell (with a thickness of more than two metres) is made of light bricks set in a herringbone pattern and is the self-supporting structural element while the outer dome simply serves as a heavier, wind-resistant covering. You do not need to get inside the cathedral to climb the dome. The entrance to climb the dome is outside of the Duomo of Florence, on the left side if you’re standing in front of the cathedral. We did get in line to climb the dome. But the queue was long and didn’t seem to move at all, so we stepped out of the line and therefor did not climb the 463 steps to the top. I’m pretty sure it’s one of those experiences you have to take, so please make sure you climb the dome and tell me all about it! 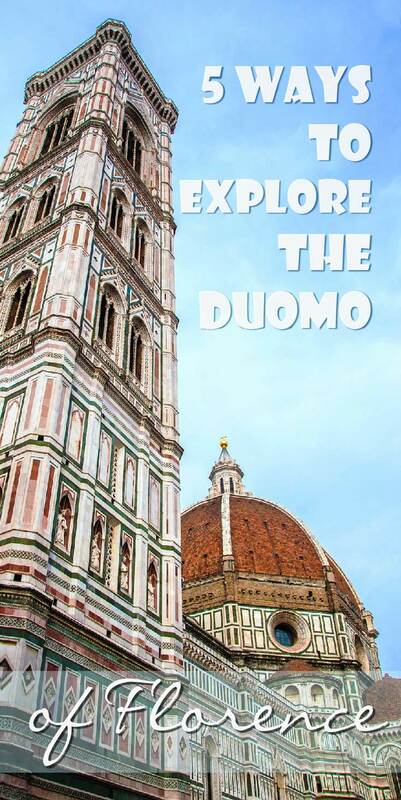 Have you climbed the dome of the Duomo? What did you think? Wait? What? A number 6? Yes, I want to be complete, although I did not visit myself. You can also go below the Duomo of Florence and visit the Crypt of Santa Reparata. The entry is located in the nave of the cathedral. You can explore a major archaeological excavation beneath the cathedral. It shows the remains of the old basilica of Santa Reparata, an early Christian place of worship. You can explore mosaics, frescos and gravestones. Bad weather coming up? Or not a big fan of climbing on top of buildings? Read my guide on the two top museums in Florence: Uffizi or Accademia, which museum to choose? Or, when you want to see the Duomo from far away, check my free walking route around Florence. So, are you planning a trip to Florence? I now have given you 6 ways to explore the Duomo of Florence. Outside, inside, from above, the side, the top and from below. It doesn’t get more thorough than that! 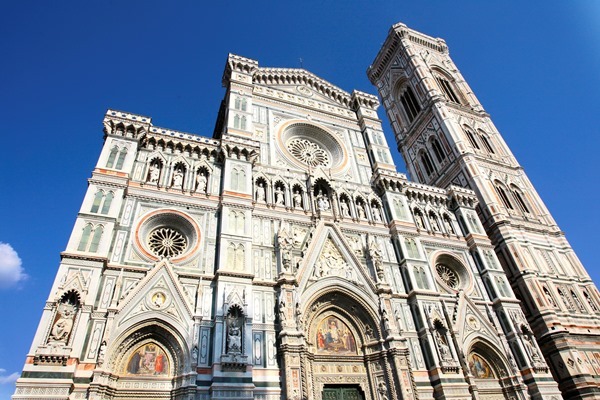 Have you explored the sights of the Duomo in Florence? What was your favourite view of the sights? Please share your thoughts in the comment section below. Great post! Florence is such a beautiful city. We did climb the 463 steps to the top of the Duomo. It was an excellent way to get a closer look at the frescos of the Last Judgment. Hi Nathalie. Ah yes. That must be amazing. That’s the one thing we didn’t do. But a good reason to go back one day. Thank you for sharing. You’re welcome Joe! What was the readon for you not to go inside the Duomo?